Antonio Brown will not be playing for the Patriots next season. Period. I’m here to let all of you know this now so that you’re not sitting there all offseason like a desperate high-school kid who heard about his longtime crush “having issues” with the douchey jock nobody likes, leading to delusions of grandeur and heartbreaking false hope. Again: Antonio Brown is not going to be traded to the Patriots this offseason. Start to let that sink in now so you don’t get caught up in all the “Antonio Brown to the Patriots rumors” that the media will surely try and shove down our throats in the coming months. Look, there’s no doubt that the Pittsburgh Steelers do not have the happiest of locker rooms right now. It all started with the Le’Veon Bell contract drama, and it’s all but certain that he’ll be playing elsewhere next season. Various sources have also claimed there’s some long-time beef and ill-feelings between Ben Roethlisberger and head coach Mike Tomlin, not to mention smaller rifts amongst other players and personnel. And now, Antonio Brown is at it again. He was benched on Sunday due to skipping practices and allegedly getting in a public argument with Roethlisberger at practice last week. (So, no, his absence against the Benglas wasn’t due to a supposed leg injury). Many, including La Canfora himself, believe it’s all a bunch of hot air and that it’s very unlikely the Steelers give into his demands. 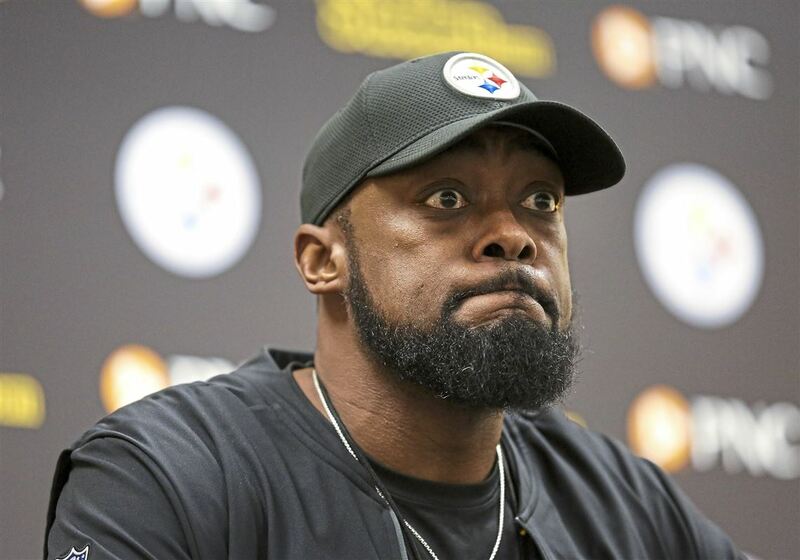 But, hey, when there’s smoke there’s fire, and this certainly isn’t the first time Brown – or any Steelers player, for that matter – has expressed extreme frustration with the team or its still-somehow-employed head coach. Seriously, this guy is not a good coach. But, even if the team does end up trading the receiver, it absolutely will not be to the Pats. I’ll tell you why. Secondly, we still don’t yet know exactly which direction Belichick & Co. want to take the roster this offseason. After offloading Brandin Cooks last year and letting guys like Danny Amendola and Dion Lewis walk, it would be surprising to see the team once again try and load up by going after older, expensive, big-name targets to pair with Brady – even though he desperately needs them. As I said they needed to do last week, the team may start looking more toward the future sooner rather than later, and acquiring Brown would seem to counteract that effort. Plus, I’d much rather see them use the money to lock down a guy like Trey Flowers, who is a free agent this offseason, for the long term. Flowers is the future of the team’s D…if, of course, the team is actually willing to pay him. Also, what happens if Brown comes here and Brady retires within the next 1-2 years? You think this guy would be content playing with anything less than a H.O.F.-level quarterback? No freakin’ way, man. No wayyyyy. Finally, above all, I’m pretty sure the Steelers’ brass would rather hang themselves from the top of Heinz Field with a Terrible Towel before ever trading one of the game’s very best players to one of their biggest all-time rivals. Unless the Pats were willing to give the Steelers their next half-decade’s worth of first-rounders and more, the Rooneys aren’t shipping him up here. Again: no freakin’ wayyyyy. So, yes, while seeing A.B. in a Pats uniform would be a dream come true, I’ve already resigned myself to the fact that it’s just never going to happen – and you should, too. Sorry to break it to ya, Pats Nation. This entry was posted in NFL, Patriots and tagged Antonio Brown, Antonio Brown Patriots, Antonio Brown Rumors, Antonio Brown Trade, New England, New England Patriots, Patriots, Patriots Rumors. Bookmark the permalink. According to the Pittsburgh press, the cap hit would only be $6M when the 2019 salary comes off the books along with his roster bonus if the trade is made by the March 18 deadline. But, you’re right, that front office isn’t trading him to any AFC contender. Hey Jared. Thanks for the insight. I must’ve missed that. So you mean that’d only be the hit for Steelers if they trade him? Wouldn’t any team who traded for him be responsible for the full $22.2 mill, though? Just wanted to make sure I’m understanding what you meant.